Lisa Durden is suing her former employer, Essex County College, after she was fired over a controversial appearance on Tucker Carlson Tonight in which she defended a “no whites allowed” Black Lives Matter Memorial Day party. 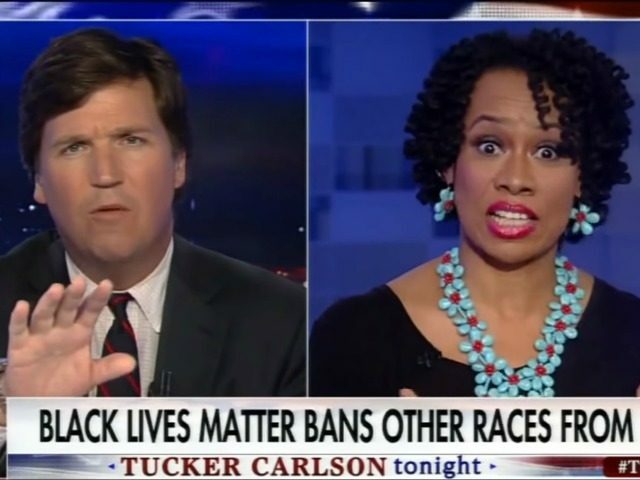 Durden’s June 2017 interview with Tucker Carlson sparked a backlash after she defended a “no whites allowed” Black Lives Matter Memorial Day party. In response, Carlson said Durden’s position was “so hostile and separatist and crazy.” “It’s such a basic violation of what I thought we all agreed on, which is you don’t attack people for things they can’t control, namely their race,” Carlson added. After Durden’s appearance, Essex County College President Anthony E. Munroe announced that Durden would not be asked to return to her adjunct professor role. Munroe explained that Durden was suspended due to the controversy that arose from her Fox News appearance. Now, Durden has filed a lawsuit claimed that Essex County College violated her First Amendment rights. Ari Cohn, an attorney for the Foundation for Individual Rights in Education, argues that it is “indisputable” that Durden’s commentary on Fox News was protected by the First Amendment with regards to her employment at Essex County College. It is indisputable that Durden’s speech is protected by the First Amendment, and indeed constitutes precisely the type of speech that the First Amendment was intended to protect. Durden spoke as a private citizen and was introduced only as a “political commentator,” and . . . [President] Munroe’s statement even acknowledges that she “was in no way claiming to represent the views and beliefs of the College.” Durden’s expression was also squarely related to a matter of public concern, as evidenced by its coverage on a national news program. She opined on a contemporary political and social movement and its tactics, a matter of significant public debate around the country. The lawsuit also takes issue with the college’s explanation of why Durden was suspended. Essex County College’s internal records do not support its leadership’s claims that it was “immediately inundated” with “feedback from students, faculty and prospective students and their families expressing frustration, concern and even fear” about Durden’s views. To the contrary, the records indicate that administrators had already decided to take action before any member of the public contacted them. And, for the first 13 days after Durden’s appearance, only one person contacted the college to complain.